Back when I was a vegetarian I cooked a lot of Indian food the seasoning is so satisfying. This potato salad is inspired by a recipe I once had for a warm Indian potato salad. It has a little kick which is a nice change from the standard salad we have had all summer. 1) Chop potatoes into 1 inch cubes and put them in a large sauce pan. Cover them with cold water and add 1 tablespoon of salt to the water. Bring to a boil and lower to a simmer. Cook for about 10 minutes or until potatoes can easily be punctured with a fork. 2) While the potatoes are cooking in a large mixing bowl whisk together the dressing ingredients and chop the onions and parsley. 4) Check if it has enough salt and is moist enough. If it seems a little dry mix another tablespoon of olive oil into the salad. Serve hot or cold. 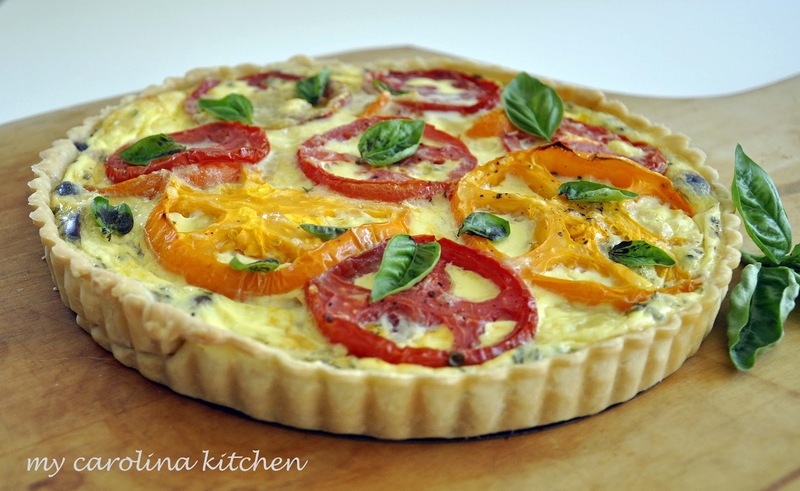 This tart is made of magical layers of tomatoes, cheese with a little shallot and olives...seasonally sensational. 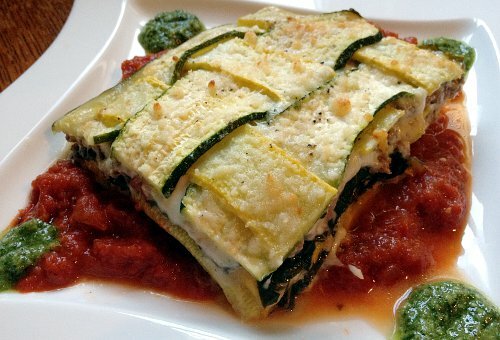 A noodleless lasagna that will truly use up your squash supply. Healthy and gluten-free. Is it possible a healthy dessert? Well these cupcakes are choke full of zucchini & carrots...delicious. Off again to the woods... unplugged and enjoying nature. So sorry I will not be able to respond to your comments, but I will enjoy reading them upon my return. Sounds like you've got a great weekend planned. Enjoy! Thanks for hosting and I love your salad! I love Indian food and potato salad. That's a perfect combo in my book! Potato salad is my comfort food. Happy Foodie Friday everyone! I'm sure this week we'll have more fabulous recipes on the run. Looking forward to more. You have a great day, Diane. Thank you for hosting! Your salad sounds wonderful! What a pleasant surprise to see my tomato tart featured. Thank you so much. Thank you for hosting. I've brought Pheasant Eggs on Sausage Toasts - a very special and unusual treat. Enjoy your down time away from it all. We used to go to a place so remote that if anyone needed us, they would have to charter a ferry boat to bring us a message. Yes, you got here before I woke up to tell you. Absolutely beautiful tart and my co-host featured you too. 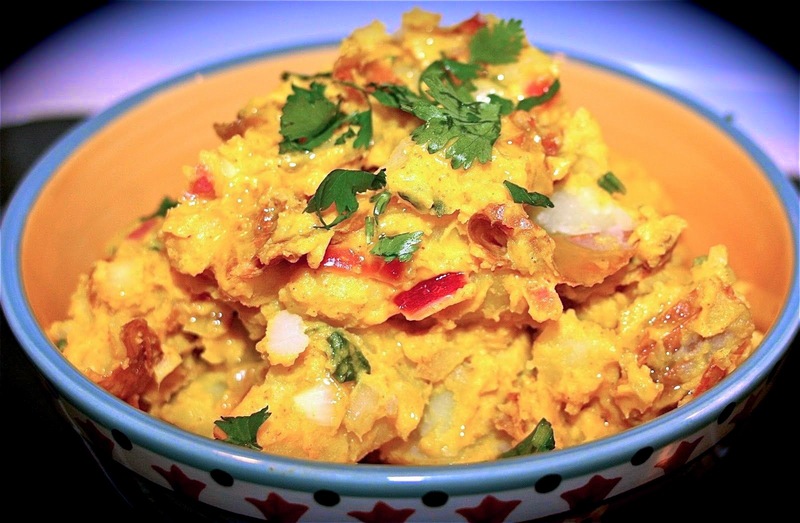 I really like the wonderful spices you have used in your delicious Indian Spiced Potato Salad. What a great twist on traditional potato salad! Thanks for hosting! THis week, I shared my Beet and Broccoli Pesto Blooms! They're Gluten/Grain Free, Vegan and Specific Carb Diet SCD Friendly! Have a great weekend! I am going to pin that potato salad to make for my hubby! I think he will flip for it!! lol Thanks much! What a nice group of summery features. Thank you for hosting! Thank you so much for including my Zucchini Carrot Cupcakes! I just love your Foodie Fridays! PS - I hope you had a great time in the woods today! Good collection of all variety recipes and especially Indian Spiced Potato Salad recipe. Different cooking of all Salad recipes and these are good taste and easy to make.